We are saddened by the recent news of the passing of Kathleen Hanson, advocate, Peer Support & Wellness Specialist, and Vice-Chairperson of the Protection and Advocacy for Individuals with Mental Illness (PAIMI) Advisory Council. Kathleen was an advocate possessed of both wit and grit. Her passion and knowledge gained through her life experience as a person with a disability made her a potent, effective advocate. Kathleen actively engaged with administrators and department heads in Nebraska’s behavioral health system to make sure the voices of people with disabilities were heard. Her humor and passion for the work will be greatly missed. 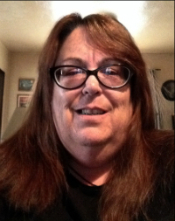 In memory of Kathleen, we are sharing a guest blog post she composed in 2015 about the Olmstead decision and a call for greater choice and support for Nebraskans with significant mental disabilities living in community settings. "Can we change this? I think we can." Hello, my name is Kathleen Hanson and I want to thank Disability Rights Nebraska for asking me to write as a guest blogger. Over the past several years, I’ve become very interested in the Olmstead v. L.C. decision by the United States Supreme Court in 1999. This court decision, now known simply as Olmstead, requires that people with mental disabilities live in the “most integrated settings”, which are usually community settings, and receive the “least restrictive” care possible. Although the intent of the Olmstead decision is praiseworthy, the reality of what life is like for people with significant mental disabilities living in community settings in Nebraska, is often at odds with this intent. I am very concerned about and feel passionately for people who have very little options other than having to live in Assisted Living Facilities (ALF’s) because they tend not to meet the requirements for being a “most integrated” and “least restrictive” setting. The concerns I have are based on my own experience and what I have learned from talking with other people who live in ALFs. In the 1980’s I lived in one but I was fortunate that I was able to move out, live on my own, and be a member of my community. For many people who live with a serious mental illness, ALFs are a form of congregate living and, oftentimes, an institutional setting (former nursing home) within the city or town in which they live. For many people, living in an ALF does not provide for meaningful community integration nor is it inclusive because there simply aren’t opportunities for the people living in them to be included and integrated within their community. I find it particularly discouraging when state policy makers claim that it is actually cheaper to have people live in ALF’s than it is to have them live in independent or supported housing, while at the same time claiming that not everyone needs to be living in them.